Jehovahs Witnesses and Mormons are the main groups summarized. Others are given shorter summaries, such as Scientology, Christian Science, The Way International, Moonies, Unity, and TM. You might find it helpful as a quick reference. Click here. I also have a list of Favorite Links to help with Cults and other religions here. 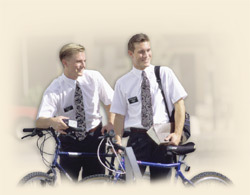 For a Quick Summary to help witness to Mormons, click here. To read "Interview with Two Mormon Elders," click here. To read "Ed Decker Answers the Mormon Elders, click here.